Marc Warren believes he is beginning to take his game to new heights after narrowly missing out on the Qatar Masters title. 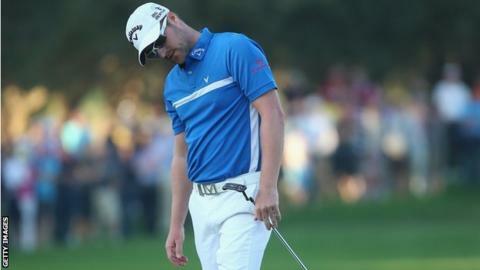 South African Branden Grace pipped the 33-year-old Scot to first place after Warren missed a birdie attempt at the par-five 18th in Doha. "The last 10 holes was some of the best golf I've ever played," said Warren, originally from East Kilbride. "I wish next week started tomorrow after playing 10 holes like that." Had Warren holed the birdie putt, he and Grace would have contested a play-off to decide the winner. "My game wasn't without its mistakes but it was foot down and going forward all the time," he said. "I felt I was swinging well at the last few holes, going at flags and the putts were going in. So, overall it was a really exciting day." Warren made eight birdies in his final round of 67 on Saturday and finished on 18 under par, with Grace - who won his sixth European Tour title - on 19 under. "Overall it's been a massively positive week," said Warren, whose last European Tour win was the Made In Denmark Open last August. Next up for Warren is the Dubai Desert Classic, which fellow Scot Stephen Gallacher won for the second consecutive time last year.